Having guests over for a party or a meal can bring much joy. But, it can also bring out the ‘pain points’ of your current home’s floor plan. Does having a kitchen where everything everyone needs is in the same corner sound familiar? 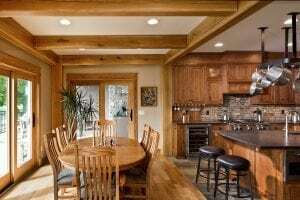 However, if you love to entertain, there are some simple features you can add to your new timber frame home that will make hosting your friends and family a breeze. Flexibility is key when entertaining. From unexpected guests to an event suddenly becoming a formal affair having the right amenities for the situation is key. Many families like to have a formal dining room where they can sit the entire family for the holiday meal. However, dedicating square footage to a large table that is only used occasionally is not the best use of space. A great solution is to have a dining room without walls on every side. That way leaves can be added to the table, temporarily expanding it into the great room. You may also want a more informal eating space for casual gatherings. Consider designing a breakfast nook, island snack bar, or a special space in your sunroom. These extra spaces can also double as the kids’ table during parties or give everyone a seat when the number of guests is a few more than you expected. If you find that one or two guests usually turns into a fiesta, you probably keep a stock of supplies to whip up a bite to eat on hand. Cabinets can get easily crammed, making it had to pull anything out, find something, or know when you run out of an essential ingredient. Designing a pantry into your new home is an easy fix. If you want to save on square footage have a special cabinet pantry designed for the supplies and tools you frequently access. Walk-in pantries take some square footage but can grant room for a few extras. With more room for storage, it can be easier to find items. In addition, you can store more than just food. Holiday plates, large accessory kitchen appliances, vases, and more can all have their own special place. Large pantries can have counters giving you more work space to prep a large meal. You can even add a mini refrigerator with snacks giving your guests a place to grab a thing or two without walking through the middle of your busy kitchen. Built-In bars add a secondary place to prepare drinks and create convenience for you and your guests. Having a dedicated cocktail mixing area in the kitchen is perfect if you want to have guests serve themselves while you finish up the dishes. However, you don’t necessarily need to put your wet bar near the kitchen. Add the space where your guests mingle, like your rec room or an outdoor space. While many people entertain in the main living area of their home, you have an opportunity to create secondary spaces you are dreaming of when building a new timber frame home. Incorporate a theater room in your basement for movie nights, or if your home is the grandkid’s hangout, a game room could be the perfect addition to your layout. If you do not want to add a large space to your layout, consider smaller spaces that still make it fun to entertain. Wine tasting and poker rooms don’t need to be big to create lasting memories. 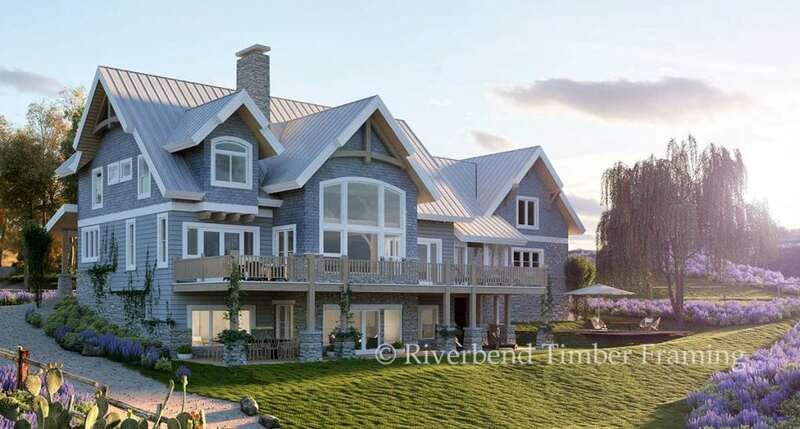 The Melody Lane design concept by Riverbend Timber Framing is perfect for entertaining. This floor plan includes an open dining room that connects to a screened porch and a kitchen island with seating for four. The oversized pantry has plenty of storage and room for a second refrigerator. Downstairs is a game room for the kids and an entertainment room complete with a wet bar for the adults. Not exactly what you are looking for? Many of the ideas listed in this blog can be integrated into any of Riverbend’s design concepts or into a custom plan you create with our design group.